Heat waves shimmered across the asphalt. Alleyway trees, mostly ailanthus and catalpa, quivered against the rare breeze. Midday streets were nearly empty as the collective of Springfield business folk braced themselves against yet another scorching August day. Downtown Springfield, Missouri. Just another medium-sized city in America, it would be easy to assume. 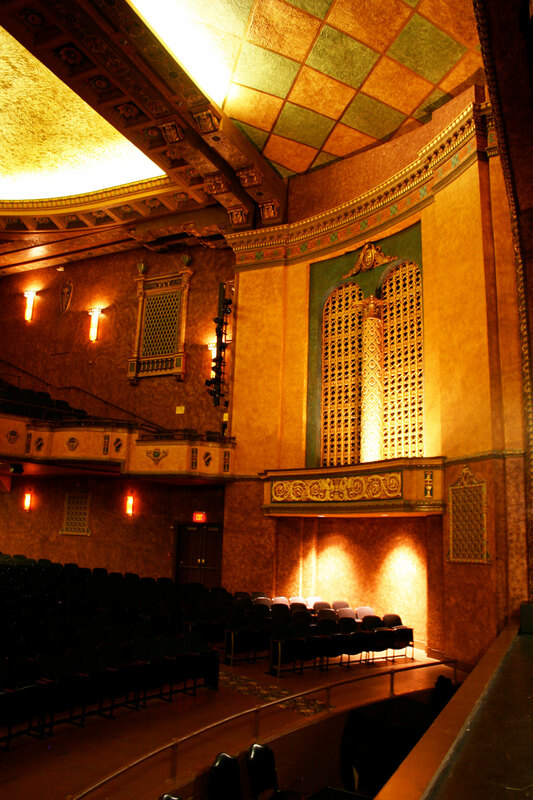 But assumptions are always risky and I was on a mission: To research the then-84-year-old Gillioz Theatre. Outside, the Gillioz (PRONOUNCED GILL-oiz) appears a bit plain — monolithic red brick and little more. Within, ornamentation wildly beyond expectation. 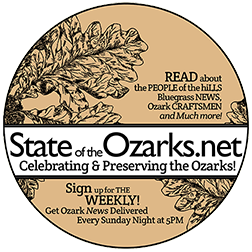 A bejeweled Christmas ornament of sorts at the heart of the Queen City of the Ozarks with history that spans the 20th century. 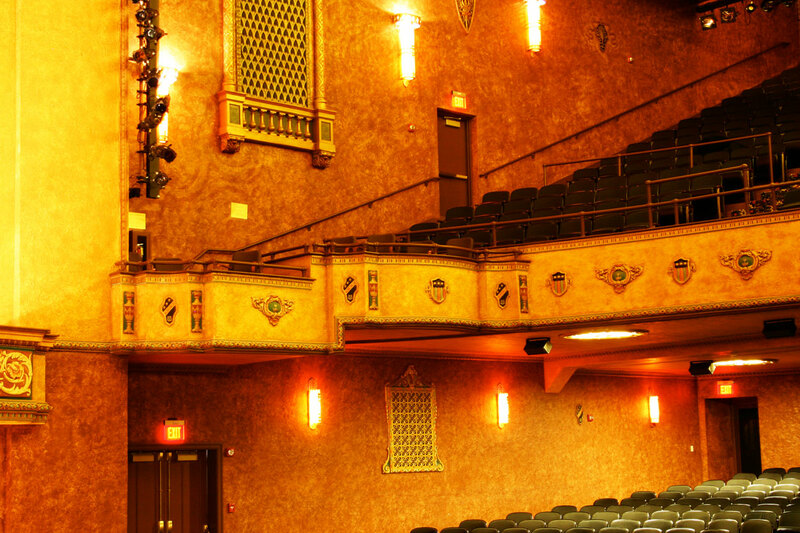 Extensively restored, the Gillioz played host to numerous celebrities and uncountable numbers of great films. Perhaps the most unlikely of celebrity guests was Elvis Presley who stole away from his entourage just to watch a film. Colonel Tom Parker found Elvis in the back row of center section, between the left doors and the stained-glass windows. One could spend hour after hour mesmerized not by the films or performances but by the seemingly endless architectural motifs. Flemish stencil-work and baroque woodcarvings flank heavy wooden support beams. Scrolling Arabian screens and carefully painted plaster mimic the walls of Spain’s famous Alhambra, a Moorish castle near the Andalusian city Granada. 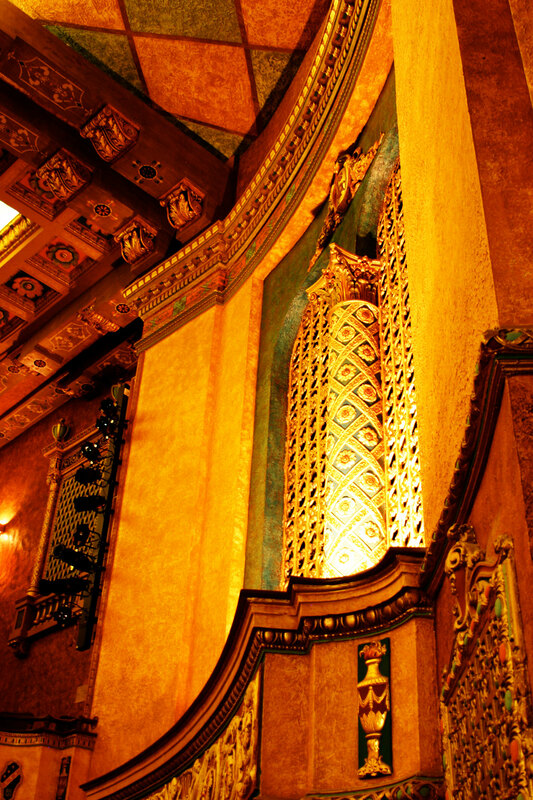 The vast column-work, soaring upward from the balcony itself, served more than fantastic decoration. It was originally a screen to cover the pipes of a massive pipe organ. 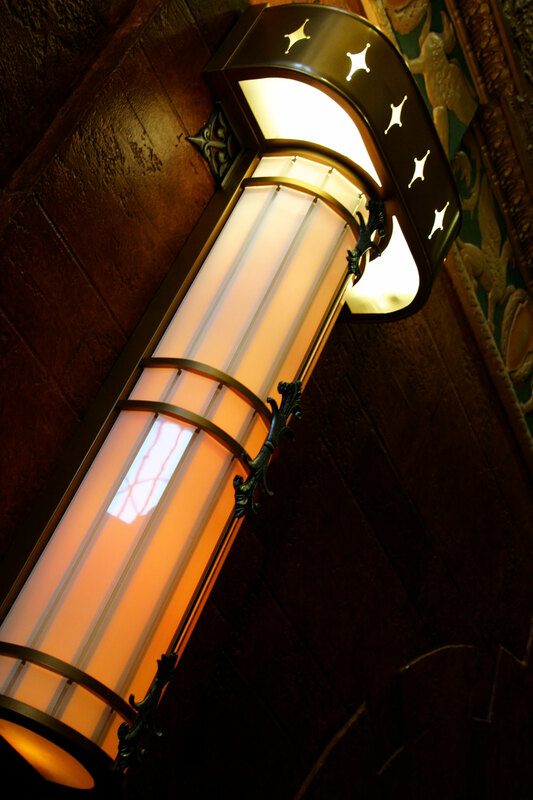 Additional Arabesque stylings are found throughout the auditorium. 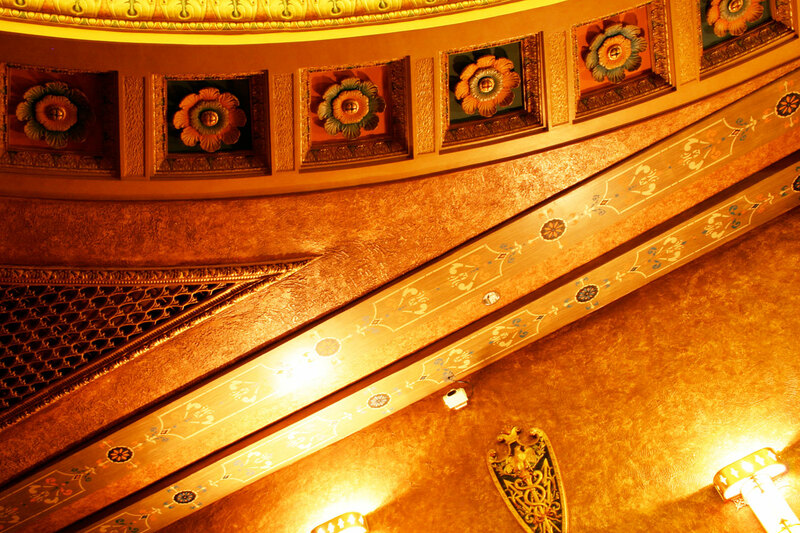 Stare up at the ceiling to discover a riot to styles, surprisingly harmonious in the warm light of the Gillioz. Spacious box seats are still reserved for famous guests. It was in the lower-left box seats Ronald and Nancy Reagan would view the film The Winning Team in early summer of 1952. A lower portion of the Arabesque screen may also be seen at distance, below left. Gaze above and reminisce of a greater time and place — when craftsmanship and artwork held sway in the great public spaces. Architecturally, it was a moment of optimism and joy. 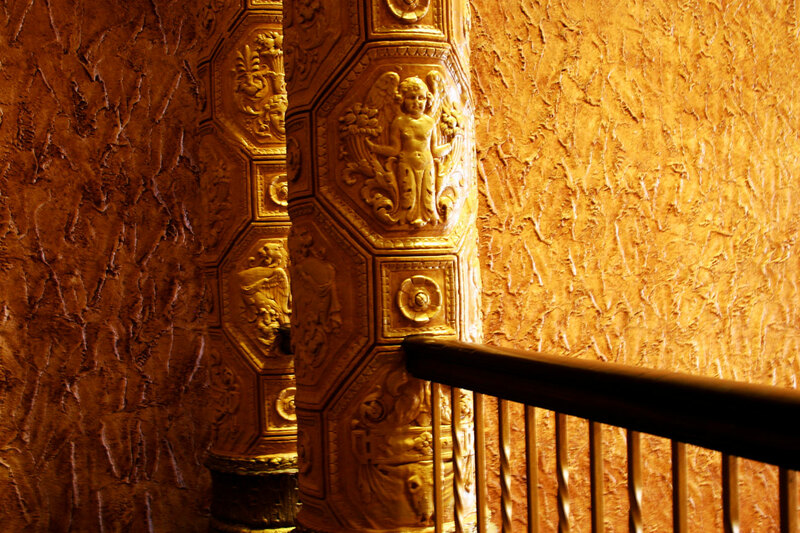 Tiles of Italianate angels adorn support columns in the upper levels of the lobby, competing for attention alongside celestial faces, cow skulls, Greco-Roman faces, and griffins. Heavy plaster textures the walls. 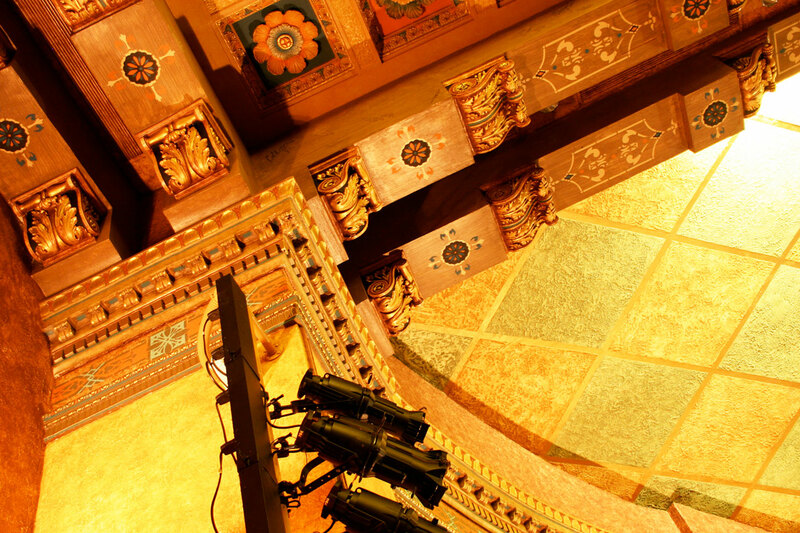 The great domed ceiling of the auditorium is festooned in flowers — Flemish-styled and crafted of plaster and wood. Continental European stencil-work continues, framed by ventilation grates of Moorish scrollwork. 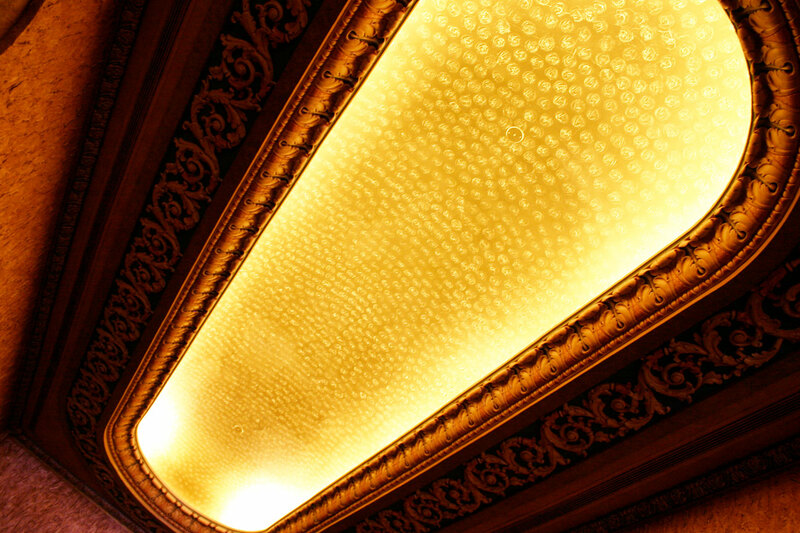 Renaissance-like floral embellishments bedeck an art deco lighting fixture — not a chandelier but instead a massive recessed ceiling, lit from the sides. 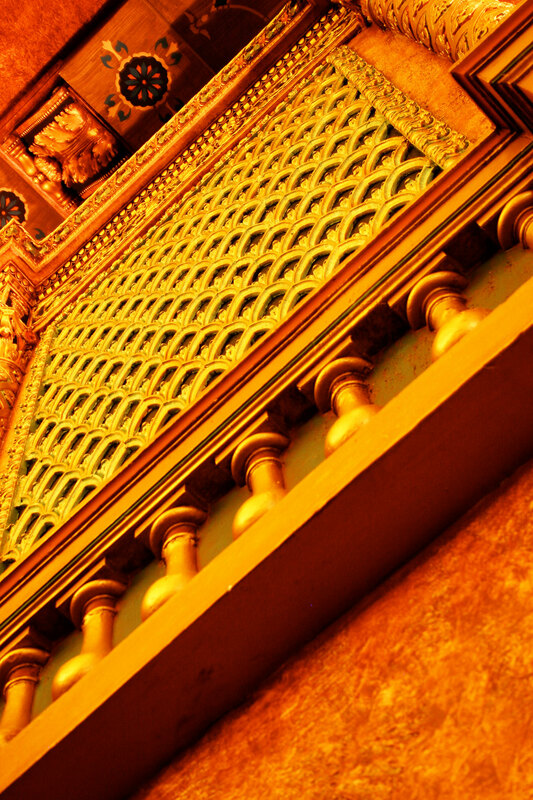 The carefully textured gold roof reflects light throughout the balcony lobby. Against all odds, original wall lamps survived years of neglect. Here griffins embossed upon the walls contend with Coptic brick and classical art deco sconces designed to change colors depending on the season — warm orange for cold weather, cool blue for summer. Outside, Springfield waits, seemingly holding its breath against the oppressive temperatures. Within the heavy brick walls of the Gillioz, the magic remains — a mysterious treasure, a place of enigmatic artwork, of shadows and film, a treasury of the 20th century — cool and dark against the summer heat. Originally published FEBRUARY 18, 2011. Having had the opportunity to enjoy the glamor and glory of the Gillioz in the 50’s and 60’s was certainly “big time” for those of us who lived in the Hills. M. E. Gillioz was a Road Contractor from Monett and certainly left a legacy of the grand days that existed — in many ways—in the Ozarks.